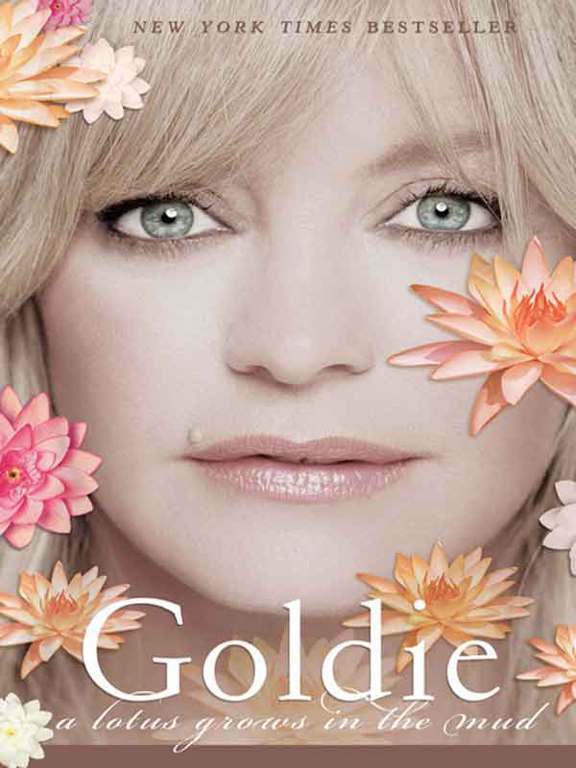 Berkley is a registered trademark of Penguin Group (USA) Inc.
A lotus grows in the mud / Goldie Hawn with Wendy Holden. 1. Hawn, Goldie. 2. Motion picture actors and actresses—United States—Biography. I. Holden, Wendy, date. II. Title. For my beloved Kurt, who I believe was sent from above. He continues to encourage me to run the race, to live life honestly, to never forget to play and to love as if there is no tomorrow. For my children, Oliver, Kate, Wyatt, and my stepson, Boston, who remind me each day that miracles do happen, and who have shown me that my heart can hold more love and joy than I ever dreamed possible. For Deloris Horn, who has been my assistant for thirty years. Who has stood by me through the good times and the bad. Who has held my life in her hands and sometimes in times of sadness held me in her arms. I am more grateful to her than words can express. We have been together from the beginning, before our children, during the blessed birth of our children, right through to the time they fled the nest as young adults. She has my life tucked inside her heart. She possesses the rare human qualities of truth, honesty, integrity and honor. I love her with all of my heart, and without her my life would never have been the same. Never. I will miss you, De, for I understand that it is time for you to take time for yourself. You deserve that and so much more. I love you. don’t have the answers to the big questions in life. I’m still on my own road to discovery. And, yes, I have been incredibly lucky. But everything is relative; everything has its story; and everyone has obstacles to overcome. They are our greatest teachers. Each of us goes through transitions and transformations. The important thing is that we acknowledge them and learn from them. That is the idea behind this book. Not to tell my life story, but to speak openly and from the heart about episodes in my life in the hope of explaining how they changed my perception and how they helped me to look at the world more clearly. I am no pundit. I have only my own life experiences to go on. And the obstacles I have overcome in life have been, in my way, difficult. There may be some who criticize me for not going into intimate details. But that is my decision. I have too much respect for the people involved, and some things are sacred. Some things we need to keep to ourselves. So I am not looking to exploit the story of my relationship with anyone in order to explain myself. I can speak about my feelings without details, and you can fill in the spaces if you wish. Every relationship is a gift, and that is the theme of the book. What great gifts I have been given by each of the people I have encountered on my journey through life. How they have helped shape me into the person I have become and still hope to be. Humans are the most extraordinary creatures, and a big part of me still wants to reach an even greater understanding about who we are. Not because I need to know more, necessarily, but because I am drawn to the process of discovery. If someone asks what makes me happiest, it is never anything I can quantify like a house or a possession or something I can touch. It is the spirit of the human being, which can fill me with more joy than anything in the world. And that’s what I’ve learned on my journey, that my spirit is uplifted by these encounters. Yes, I have met some bad people along the way. But I have also met some amazing souls, and their light fills me. I’d rather be standing at the bottom of the mountain looking up than at the top of the mountain looking down. waddle through the back lot of Paramount Studios, six months pregnant with my second child, Miss Katie. She kicks and rolls as I wend my way in the dark to the restaurant where I am meeting two young writers to discuss a possible new film project. It is the winter of 1979. The air is cold and damp. I am tired. I gather my coat around my big belly as I approach this landmark eatery where the old ghosts of Hollywood hover and the new players meet, share ideas and gossip unceremoniously about one another. I am sick of looking at myself day after day trying to make the words fit in my mouth as each scene moves along silently with just a click track in my headphones. Thank heavens it’s almost over and I can just concentrate on having my second baby and returning to my so-called normal life for a while. Maybe it’s not too late to make my marriage work, I think to myself. Maybe if I spend less time working, doing films back-to-back, and more time at home with Daddy Bill and little Oliver, we’ll be okay. If my new production company takes off, giving me a little more control over the movies I produce and can make for other people, then I can throttle back for a while. I open the door to the restaurant and see Nancy Meyers and Charles Shyer sitting in a booth near the window. They are animated, energetic, inspired and full of youth. I like them immediately. We laugh about the archaic way that that particular Italian director makes movies. The menu comes, and I order my weekly dose of liver while my companions jump right in explaining what they’re up to. I settle into my seat, ready and eager to hear. “It’s a story of a spoiled Jewish girl named Judy Benjamin who joins the Army on an impulse after her husband drops dead on their wedding night,” Nancy says. “While making love,” Charles chips in. “She hates the Army and can’t wait to get out and be normal again!” continues Nancy. I’m loving this pitch. I laugh and laugh as they tell me the rest of the story. The concept is so fresh, so brave and original. The female lead carries the whole movie, almost by herself. She embarks on a personal journey and becomes empowered and independent and strong. It couldn’t be more different from my last movie. I can feel a flutter of excitement in my belly that has nothing to do with my baby. This is a dream role for any actress. My fatigue melts away, and my heart races at being asked to play one of the best characters I have ever been offered. “What’s the film called?” I ask Nancy and Charles. Feeling the warmth of my baby resting on the tops of my thighs, I shift in my seat, wondering, praying Judy Benjamin will wait for me. “In three months. She’ll be born at the end of April, actually.” I stroke my belly, happy at the prospect. I lower myself into the front seat of my Mercedes and start up the engine. Heading for home, I wonder what on earth I’m letting myself in for. The executives were not only trusting that two women and a man could produce this film, they were also banking on a story about a woman going into the Army bringing a good financial return. The Hollywood film industry at that time was still controlled by men. to see it.” He was a source of such support during the usual obstacles all films come up against in the long process of production. It was an exciting time for all of us. We moved into our offices on the Warner Brothers lot and began to build the dream team that would, we hoped, bring this wonderful script to the silver screen. We needed everything from a director and cast to a cinematographer and set designer. We needed to look at actors and locations, costumes and line producers. All this just six months after I’d given birth to my perfect baby girl. I drove joyfully to our offices almost every day, packing my tiny Kate in her little car seat, her bottles and cereal in my bag, along with a few rattles and toys and her fold-up playpen. Oliver was in preschool, and his nanny looked after him when I wasn’t there. It was so great having Kate cooing away in the office with us in the midst of the hustle and bustle of pre-production. For reasons I was never sure of, he dropped out. He was a good man, and there were no hard feelings. It was difficult, however, to find another director at that stage of pre-production. As fate would have it, we were crossing the streets of the back lot on our way to lunch one day when we ran into a director friend of Nancy and Charles’s: Howard Zieff. Throwing all caution to the wind, Charles popped the question. “Hey, Howard, what are you working on these days?” Charles asked. So there goes another Hollywood story. Howard Zieff became our new director. that I couldn’t win this one. There was never enough time in the day to accomplish my dream of having it all. Sometimes I’d get home much later than I might have wished and was unable to meet everyone’s demands for attention. Some nights I raced home just to bathe my babies and tuck them in bed. I knew that my marriage was suffering as a consequence. The struggle of juggling all this was an enormous burden to bear, and the guilt relentless. The icing on the cake was the slight chance that this film would be a great big fat success. But I also feared that possibility. I knew that if it was a success, my obstacles would only be harder to overcome. The pressures that would put on my already fragile marriage would be almost insurmountable in this business where one party always feels left out of the parade. But I was on this fantasy ride at Disneyland and I couldn’t jump off. For one thing, it was way too much fun, and, second, the train had already left the station. he film was a bigger, fatter success than I could ever have imagined. Not only was it the great creative collaboration of my life, it was the most thrilling time in my professional career. The movie opened at the theaters even better than anyone expected, and the only name above the title was mine. There was no male star to carry the picture, as they say, as was usually the case. If ever I had suspected how life-changing this movie would be for me, I could never have guessed how much. I was touted as the Hollywood actress who broke the rules, broke box office expectations and blazed a new trail for women, especially for actresses who wanted to produce films for themselves and for others. and Charles Shyer has directed many films since. My marriage finally cracked under the pressure, and the double-edged sword of my supposed new power in Hollywood stuck in my side. I’d only feared what success could do to destabilize my home life; I hadn’t considered the reaction within the industry. It was increasingly difficult for me to be simply an actress for hire. I kept hearing things like, “But Goldie does her own films.” Even though I met many wonderful, strong directors with great roles to offer, none of them hired me. I began getting a complex, thinking that they didn’t want to work with me, when, in truth, they just didn’t want the baggage of “Goldie Hawn.” This realization was so crushing to me. Of the films I have made since then, some I have produced and some I have not. I’ve worked alongside some very good directors and some not so good. I have been fearless in arguing points I have felt strongly about with studio heads. I have made some friends and I’ve made some enemies trying to help make my films be as good as they can be. Sometimes I was right to share my vision, and sometimes I was wrong. My only hope was that a great collaboration would be sparked, and that ego and fear would be left outside the door. But my passion and commitment to work was no longer tempered by the fear of not being liked. My tenacity and determination to be true to the person I had become were sacrosanct. I guess I came to know this about myself: for better or worse, I don’t give up.